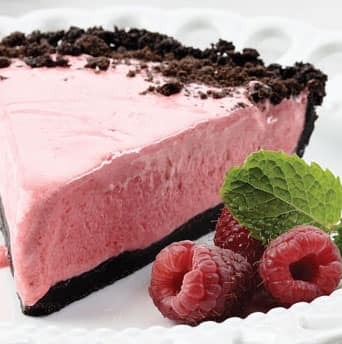 This creamy, luscious pie is made by combining a fluffy cooked meringue with a raspberry puree, then pouring the mixture into a chocolate-cookie crust. Cover with plastic wrap and store in the freezer for up to 2 weeks. Mi-Del will also work, but the chocolate flavor isn't as rich. Health Advantages: low calorie, low sat fat, low cholesterol, low sodium, heart healthy.